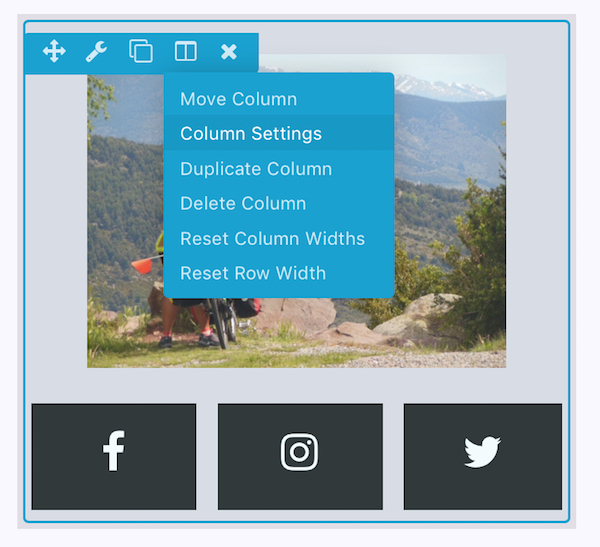 In Beaver Builder you cannot have rows within rows, but you can construct complex layouts with column layers and child columns. In any row, you can have multiple vertical layers of parent columns, child columns, and modules. Here are some diagram examples of a single row with various configurations of layers and columns. In Figure 1, there is one column inside the row, and the column contains three module layers. You can have any number of module layers within a single column, but only one module in each layer. If you want to more than one module in a layer, add a new column for each module. In Figure 2, there are two column layers in the row. The first layer has one column and the second layer has two columns. Note: You can have a maximum of 12 columns in a layer. You can have as many module and column layers in a row as you like. A column within another column is considered a child column. In Figure 3, there are two module layers and then a layer with two child columns. Note: You can have a maximum of four child columns in a layer. You can have as many layers of child columns as you like. You can also have a single child column in a row with module layers. In Figure 4, there are two module layers and then a layer with one child column. Why would you want to do this? Usually, it's because you want to add a background color or image to the child column but you still want the modules and the child column in a single parent column (perhaps to add another background color or to line up content in another column to the left or right). The real example in the next section will make this more clear. Note: By default, when you drag a module into a column, you create a module layer. If you want to create a child column, you usually need to add one or more empty columns inside the main column before you add modules. See the Related Article below on inserting columns for instructions how to do it. Here's an example of a page with a complex layout of columns, module layers, and child columns. This is a single row with two column layers. The first column layer has two columns with two layers each, and the second column layer has two module layers and a child column layer. The main columns have a light gray background. The child columns have a dark gray background. In the upper left column, there's one layer with a Photo module, and a second layer with three child columns, each of which contains an Icon module. In the upper right column, the first layer has a Heading module and the second layer has two child columns. The left child column has two module layers, with a Heading module in the upper layer and a Button module in the lower layer. The right child column has one module layer with a Photo module. The bottom column layer with two module layers and a child column layer all contain Heading modules, with text that explains their position. Without background shading, it can be hard to tell the difference between child columns. For example, in the following screenshot you can't tell if this column layer has three main columns or one main column on the left and two child columns on the right. The best way to find out is to edit the column and look to see if there are options for the parent column. If there are, it means you have selected a child column. When you mouse over the Parent settings, the entire parent columns becomes shaded in blue, as shown in the following screenshot. On the other hand, the column on the left has no options for a parent column at all, which means it is not a child column. If you mouse over Column settings, the entire left column is shaded in blue, showing that the second layer of that column has three child columns. As screen size decreases, column and module stacking occurs left to right, top to bottom first within each column then across columns. 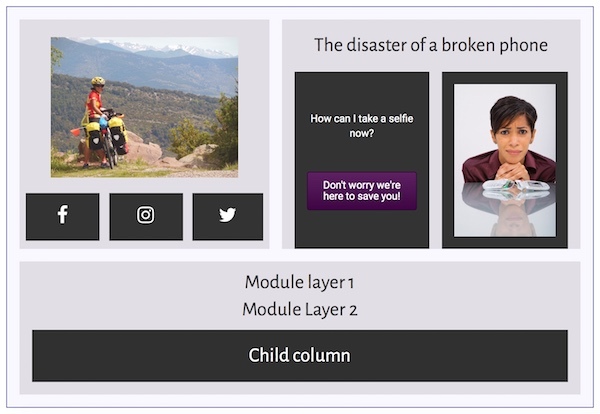 Let's go back to our real-world example and show the order in which the columns, child columns, and modules are stacked on small screens. Tip: Beaver Builder has a setting to reverse the stacking order (see the Related Article below for how to do it), but you can't choose an arbitrary stacking order. Knowing how columns will stack is an important factor in how you construct your page. 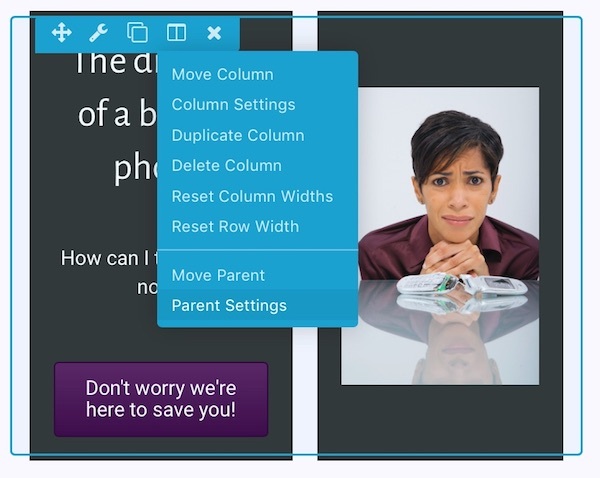 As an alternative, you can prevent column stacking by setting column widths for medium and small devices. See the Related Article for tips.